A forest can flourish anywhere there’s room to plant a tree, even in cities. That's important for the nearly 80 percent of Americans who live in urban areas that depend on the ecological, economic and health benefits provided by trees. Forest Heights, a Maryland town of 2,400 within commuting distance of Washington, D.C., overlooks a busy highway. Despite its name, it was not a forested community, at least not until Mayor Jacqueline Goodall got involved. “My vision for our town is to be the greenest town in Maryland. As a matter of fact, Forest Heights was green before green was green,” she said. Since 2008, she has planted 1,100 trees. At least 500 more trees will be planted on a plot of land near an elementary school, and Goodall has enlisted 150 students from the University of Maryland to help get it ready. The school sits on a flood plain, which causes problems when it rains. Goodall said trees are the green infrastructure that can protect the school and homeowners from property damage. “The trees are going to be soaking up some of the ground water so you are not pumping it out into the street picking up pollutants and your basement is flooding less,” she said. Fully-grown trees can also reduce energy bills, provide shade and make the neighborhood more livable, according to Julia Keen, one of the college students doggedly pulling weeds and tossing them into huge piles that will later be turned into mulch. Anne Buckelew applauds these efforts. The U.S. Forest Service scientist stopped by to check out Goodall’s progress in urban forestry. Buckelew said most Americans live in urban areas and their lives change when they see trees as assets. “We have [40 million hectares] of urban forest in the United States, and it’s really important to sustain and maintain those forests like these folks are doing here today,” she said. Goodall started her planting campaign in 2008, when she was a member of the town council. The tree canopy at the time covered only 37 percent of Forest Heights. Since then, she's turned the municipal building into a green sanctuary and planted trees in front of hundreds of homes. She said that as the trees mature, they will increase property values, reduce atmospheric pollutants and aid with storm water retention. She calculates that's worth about $3 million to the town. “When I started this, it was basically, planting the tree because it was beautiful, and the more I found out what a tree can do for the community and how much value it has added to my community… So the trees are an investment, not only to our town, but they are an investment to us, because in the end we can’t live without trees,” she said. 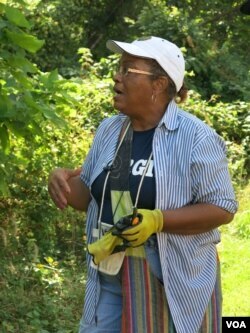 Betty Wilson has lived in Forest Heights since the mid-1980s. She admires the pink blossoms of the Crape Myrtle the town planted in front of her house four years ago. “It beautifies my house because I love to keep my grass pretty, and I like the beautiful tree and it looks nice,” she said. Wilson and her neighbors now live on tree-lined streets. Goodall said the initiative is raising awareness about health, and the economic and ecosystem services that trees provide. Her hope is that Forest Heights lives up to its name by covering its streets with a green canopy.